In holes 6mm deep, sow Coriander seeds with a space of 10cm between each, once established thin the plants so that there is a spacing of 20cm between each. Thin by snipping plants at the soil line with sharp scissors; toss it into a stir-fry mix, salad or the compost heap. The best way to ensure a continuous supply of this delicious herb is to sow in succession, this requires new seed to be sown every couple of weeks. 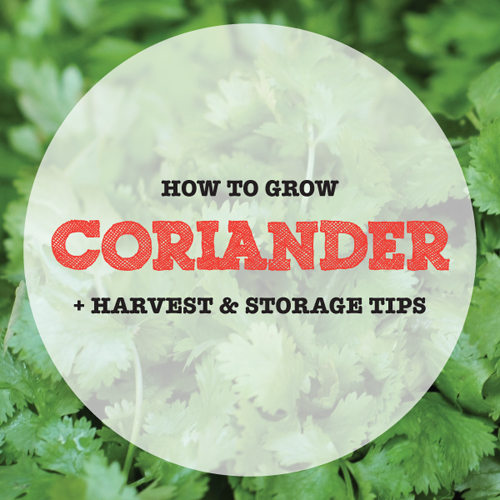 Keep Coriander moist while growing and fertilise every 3-4 weeks with a liquid feed. Seasol, compost tea or diluted worm juice are all excellent options. To harvest Coriander, use sharp scissors to cut the leaves closest to the outer edge of the plant, working your way inwards with each harvest. The leaves will regenerate, so there is no need to pull the whole plant unless the root is required for a stronger flavour in cooking. Although tempting, we suggest not harvesting from your Coriander plants until they are 15cm tall, this is usually 30-40 days after the seed is first sown. Coriander is best harvested fresh before use, however small quantities may be stored similar to flowers in a jar of water, covered with a freezer bag and refrigerated. Be sure to change the water daily and remove any yellowed leaves.